Capital flow from South Korea to Vietnam continued increasing strongly this year, the Ministry of Industry and Trade said. Recently, South Korean Ministry of Trade, Industry and Energy has worked with the Vietnamese ministry to negotiate cooperation in fields including electricity plant building, oil and gas, renewable energy, support industry, safe energy management, automobile, garment, distribution system and logistics. They have also discussed ways to boost Vietnamese seafood, farm produce and processed food export to South Korea. The two countries’ export turnover is expected to reach $100 billion by 2020. South Korea now ranks first in the number of investment projects in Vietnam with 1,287 projects and total capital of nearly $7.7 billion. 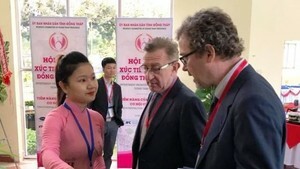 HCMC Export Processing and Industrial Zones Authority (HEPZA) said many European business delegations had required to come to the city and learn about local investment environment in the first week of the Lunar New Year. The most interested fields have been real estate, renewable energy and construction.